Governor Ayodele Fayose has reportedly declared candidate of the Peoples Democratic Party (PDP) as the winner of the gubernatorial election that held on Saturday in Ekiti state. 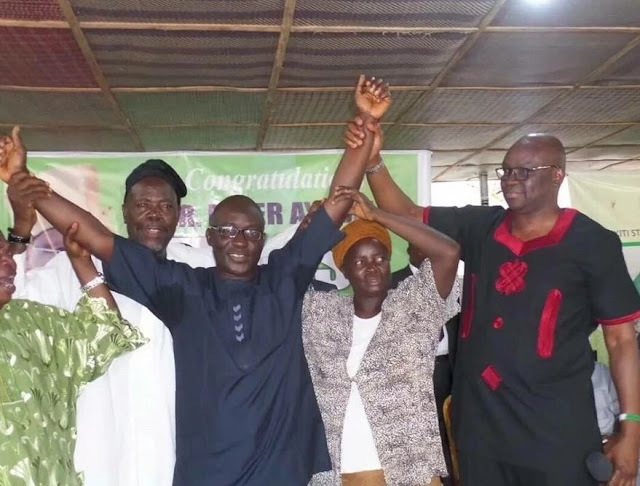 According to reports, Governor Fayose went on the Ekiti State Broadcasting Corporation to declare his Deputy and governorship aspirant, Professor Kolapo Olusola Eleka, as the winner of the July 14 poll. The move is said have prompted the Nigeria Broadcasting Commission to shut down the state’s broadcasting service as the Independent National Electoral Commission (INEC) was yet to finish collating results of the poll. While current results between the two main contenders in the poll, Professor Eleka and Dr Kayode Fayemi of the All Progressives Congress, are said to be tight, INEC is still computing results from the 16 council areas in the state. The results are being collated amid tight security at the INEC office in Ado-Ekiti, the state capital. The results will be transmitted electronically to the electoral body’s headquarters in Abuja. Meanwhile, President Muhammadu Buhari has congratulated candidate of the All Progressives Congress (APC), Dr Kayode Fayemi, for emerging winner of the July 14 governorship election in Ekiti State. Fayemi, who recently resigned his position as the Minister of Mines and Steel, was declared winner of the Ekiti election by INEC returning officer, Professor Idowu Olayinka.